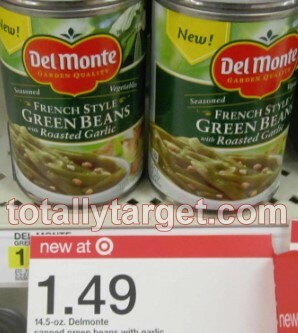 If you haven’t printed it yet- we still have a nice Target Coupon for the new Del Monte Canned Seasoned Vegetables (Green Beans or Corn). This coupon may not last long- so if you have any interest – print it quick! If it does not come up clipped right away, just change the zip in the box toward the top of the page to 77477 and then sort by baby to find it fast. This coupon states available at Walmart- but it is a regular manufacturer’s coupon that can be used anywhere. If you use Abreva Products – there is a new high-value $3.00 OFF ANY abreva® Product (2g Pump or Tube). 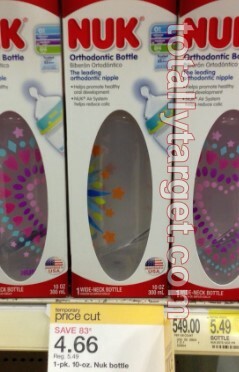 We also have unadvertised current offer at Target for a FREE $5 Gift Card wyb 2 select products thru 11/2. After Triple stack it can make for a very nice deal. You can mix and match your products but here’s an idea for you.. Check your inserts too- you may have the identical $3/1 Abreva Product Pump or Tube 2g 10-13-13 RP x12/31 to save on ink! Here’s a reminder roundup of a few nice deals at Target that will only be valid thru Saturday, 10/12 or very soon after due to ending sales or price cuts or expiring coupons. So if you’re headed to Target today or tomorrow grab whatever deals interest you while you still can! For other Target deals aside what is listed below you can always check the Weekly Ad Page at the top of my site. This page always contains links to the complete current ad, best deals for the week & sale updates. -$3.00 (use three $1.00 on ONE Kashi® Hummus Crisps (Zip 77477). -$1.00 on ONE Kashi® Hummus Crisps (Zip 77477). = $3.50 for 4 or right around .88 cents each! = $13 after cartwheel and coupon, or almost 50% off regular price of $24.79! You can get a super rare .55/2 dozen Eggs coupon when you “like” The Incredible Edible Egg on Facebook. Egg coupons are pretty rare and this coupon will probably go fast, so I would go ahead and print it if you have interest! It’s a Smart Source Coupon and I was able to print it twice by going back to facebook and clicking on the “Get Coupon” link again. NOTE- coupon prints with a recipe underneath. -Thanks to Lauren P for the heads up on the coupon! For the rest of the Sneak Peek at the Target Ad & Matchups for 10/13-10/19 check out my post HERE. You can grab a new coupon this morning for B2G1 FREE any SNICKERS, TWIX, M&M’S, DOVE, MILKY WAY, 3 MUSKETEERS or BITES Brand (1.14 oz. – 2.83 oz.) – Max value $1.29. If you don’t see this coupon clipped right away, try switching your zip to 90210. You can also stack this coupon with the 15% Off Twix Chocolate Candy (Single and King Size Only) Target Cartwheel x11/30. 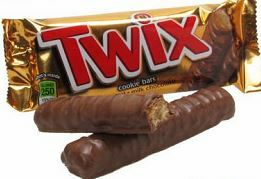 Many Target stores sell the single Twix Bars for just .67 cents, so after stack it’s a nice deal.. Even if you have a higher price at your store- you can always use this coupon at Walgreens thru 10/12 where Mars Candy Singles are just 2/$1 with an in-ad coupon. You can buy 3, use the in-ad Walgreens coupon and one B2G1 manufacturer’s coupon and pay just .33 cents each. FREE $10 Target Gift Card when you Buy 3 Angel Soft Bath Tissue Starts 10/13 – Print Your Coupons Now! 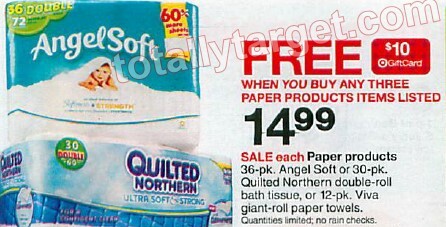 If you haven’t printed it yet, you can still grab a very nice high-value printable coupon for $2.00 off Angel Soft bath tissue 36 double rolls. Even though it shows the Walmart Logo on the screen- it prints with NO MENTION of Walmart on it whatsoever. That’s a great price for TP and is like paying just just under .12 cent per regular roll! My Pasta sides are also on Price Cut but for some reason they are higher at $1.06 and a different end date – thru 10/26, but you can mix and match on the coupon if you’d like. $1.50 off when you purchase ONE (1) Tub of I Can’t Believe It’s Not Butter (45 oz size only). Here are some new & revised cheap finds in Grocery with new insert coupon & Target coupons we got this week. I will try and get together a roundup from other store departments soon. Remember- all insert coupons have the potential to be regional and prices can vary by region, but here ya go! DIAL POWERBERRIES HANDWASH: Also – the $1/1 Any Dial Power Berries Product is back up on Facebook and available to print HERE. This coupon is good on ANY Powerberries product- and the Dial Complete Foaming Handwash is included in the sale this week thru 10/12 for $1.56, so just .56 cents after coupon.